This chart is a list of the TV anime series that aired between October and December of 2013, along with their Laconic descriptions. See Summer 2013 Anime for the previous season and Winter 2014 Anime for the next one. Second season of the fall 2012 anime. A new idol academy, Dream Academy becomes rival to Starlight Academy. Seventeen years ago, a mysterious AI navy called the Fleet of Fog conquered Earth's oceans with incredible technology. Fairly recently, a young captain acquired a Fog submarine. Also, the Fog ships have decided to create female avatars. Anime adaptation of BlazBlue, the popular fighting game. By 2036, radioactive contamination has forced Tokyo to be blockaded. The story follows three high-school girls who are sent to Tokyo, because they've been genetically engineered to be immune to radiation. A girl with an active sixth sense ends up living with six brothers, who are actually vampires. Based on an otome game. An adaptation of an upcoming 3DS game of the same name. In 2047, a mysterious substance known as "Gaimetal" is found 50,000 meters underground, and begins to be mined. But in 2055, monsters with Gaimetal-encrusted bodies known as "Gaists" suddenly emerged and attacked people. In 2056, heroes equipped with Gaimetal armor begin their battle against the Gaists. A 'battle action adventure' series, about three of Galileo's female descendants, who are on international wanted lists. About the everyday life of a miko... and a kitsune that acts as the messenger to the gods. A young man tries to avoid a childhood marriage promise by going to law school, but finds the girl he's trying to avoid decided to go to the same school. Set in the near future, Gundam models are now capable of moving and fighting. This follows a pair of boys seeking To Be a Master at this sport. Yu-Sibu for short. A boy who had been training to be a hero ends up having to get a real job, as the demon lord is defeated before he can take his hero exams. He ends up working with the demon lord's daughter. A character drama/Fighting Series set at a school. Studio Trigger's first TV anime. An assassin ends up doing anything but killing. Second season of the basketball anime. That ONA about siblings in an alternate Kyoto. It's getting a full season. 2nd season. Expect quite a few Tear Jerker moments. People are stuck in a VR game and can't log out. Yes, you have heard of at least one series with that premise recently. About a girl who hates colour. Voiced and designed by Yui Horie. A drama about an indecisive girl and her childhood friend. A girl transfers from Tokyo to a countryside school. NouCome for short. The main character is a boy is cursed with periodically being given mental multiple-choice questions, which have the answers become reality. Around the time the story begins, this power causes a beautiful girl to fall before him. A NEET is sent to a fantasy world as a moe evangelist. A two-hour long adaption of the first generation Pokémon games. The fifth installment of the long running series based on the popular Nintendo handheld RPGs. 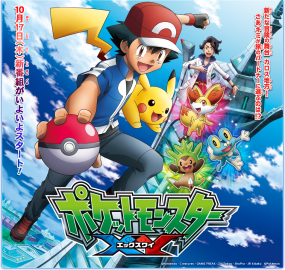 It continues the story of Ash Ketchum and Pikachu as they explore the Kalos region, the setting of the upcoming Pokémon X and Y games. The sixth installment of Battle Spirits anime series. About a young man, who, inspired by tokusatsu, becomes the hero Samurai Flamenco. An idol decides to go into female professional wrestling. The story of the world's most powerful vampire, and the girl entrusted with watching over him. Airing from September 13 for 14 episodes. A comedy about two sets of siblings, each with an older sister and younger brother. A Schoolgirl Series, about extracurrical activities. The main character comes from a family of onmyodo practicioners, but is living as an Ordinary High-School Student, as he can't see spirit energy. His life is changed upon being reunited with his Childhood Friend. In a World... where magic circuits can turn objects into automatons, giving them life and personalities, a boy puppeteer seeks To Be a Master at automaton combat, with the help of his gynoid companion. Second half of the Spring 2013 Anime. A boy at an academy for knights gets too injured to become a knight himself, and decides to help one of the female knights win the championship instead. An adaptation of a top ranked Visual Novel set in a college's light music club. An otaku who uses his commuter bicycle to climb sharp hills on the way to Akihabara attracts the attention of a competitive bicycle racer and they wind up racing together. A reboot of the manga made by Yasuda Suzuhito.